Today I found out that female seahorses impregnating their male mates, rather than the other way around. 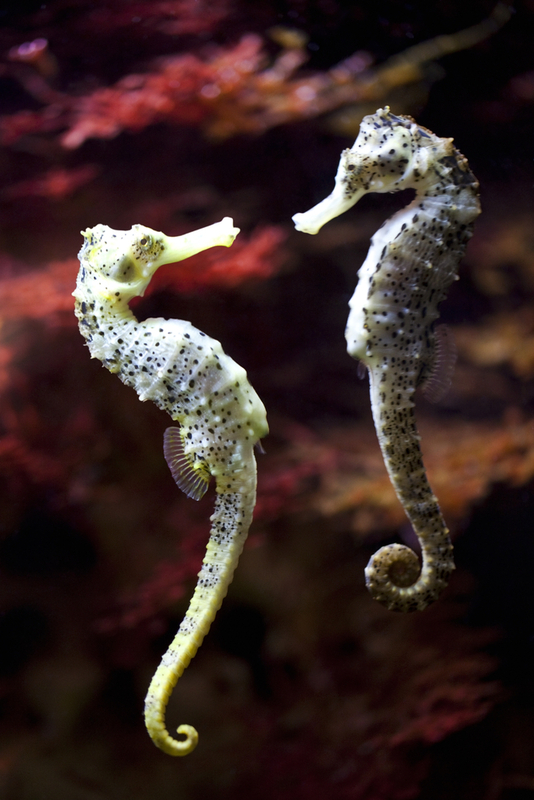 The reproductive process of a seahorse begins when a male and a female meet up and “dance”. For several days prior to the actual act of mating, the two fish (yes, they are fish) will meet to intertwine their tails and swim together. They also sometimes grip the same strand of sea grass with their tails, and whirl around it in unison. Scientists believe this courtship and dancing synchronizes the movements of the two fish to prepare the male to receive eggs at the same time the female is ready to deposit them. After several days of this, the male blows water through an egg pouch on his stomach. The water flow expands and opens the pouch to demonstrate to the female that it is empty and ready for her to insert her… ovipositor, an organ used to lay eggs. At that point, the two swim in a sort of snout-to-snout embrace, spiraling upward through the water trying to line up so that the female can inserts her ovipositor into the male’s pouch. She does this several times, resting between, to avoid becoming exhausted. As the eggs leave the female body, she slims down. As the male receives the eggs, he plumps up. This process can last up to eight hours. In the end, she deposits anywhere from a few dozen to thousands of eggs into the male’s pouch, depending on the species of seahorse. When it’s done, the female does not stay to cuddle, but simply swims away and finds a nice place to rest while her ovipositor contracts, which can take a couple hours. After his lady friend is gone, the male attaches himself to a nearby plant and releases sperm directly into the water around him to fertilize the eggs, which are now embedded in the wall of his pouch. The pouch provides oxygen and prolactin to nurture the eggs. While the female chose to leave right after the mating, she’s at least nice enough to drop by and check up on her pregnant partner. During the gestation period, anywhere from two to four weeks, the female visits the male on a daily basis, though not for long. The two simply interacting for a few minutes each time, swimming together much like they did during courtship. As the male prepares to give birth, his pouch gets rounder and rounder. In the minutes immediately preceding birth, his muscles contort, bending him backward and forward repeatedly for about ten minutes until all the babies (known as “fry”) explode out of the pouch. There can be as few as eight and as many as 200 seahorse fry born at a time. Amazingly, the male’s pouch returns to its normal size and position in only about an hour and he is ready to mate again within a few hours, and sometimes even does! The male seahorse may give birth, but as with many fish, he does not stick around to nurture the young, but leaves them on their own. In the end, around 5 infant seahorses in every 1,000 survive to adulthood. Many are eaten by predators or die of starvation when ocean currents push them away from food sources. Even so, by fish standards, 5 out of 1,000 is actually a pretty good rate, thanks to the father’s pouch protecting the little ones for a time, while other fish often lay eggs and immediately abandon them after fertilization. Seadragons and pipefish, which are related to the seahorse, also have the male being the one to become pregnant. In the case of the pipefish, though, the male may decide to digest the embryos, rather than bring them to term, if food is scarce or if he simply found his mate to be less than desirable. Seahorses are in the genus “Hippocampus”, with the name deriving from the Ancient Greek for “horse”- “hippos”, and “sea monster”- “kampos”. In women who have this type of pregnancy (where the egg attaches outside of the uterus) there is a 21% chance of a birth defect, primarily due to lack of amniotic fluid buffer and more compression than the baby would otherwise experience in the uterus. About 1% of pregnancies in female humans are ectopic. Of those, only about 1% have the egg attaching outside of the Fallopian tubes, generally attaching to the liver or bowels. While it is extremely rare for a baby to be born healthy this way, there are documented instances of this happening. A common myth about the seahorse reproductive process is that they mate for life. Many seahorse mates stay together through at least the breeding season but many others switch mates frequently. THANKS STACI FOR THIS NICE ARTICLE BUT I FIND HARD TO DECIDE WHAT WAS BETTER, THE KNOWLEDGE IMPARTED, OR THE GR8 HUMOR. ………..While the female chose to leave right after the mating, she’s at least nice enough to drop by and check up on her pregnant partner…..BEAUTIFULLY WRITTEN. TNX.